Aren't these climbing roses gorgeous! With inspiration in mind, Tom did some sleuthing and found a resource for recycled barn wood and gray board. We took a road trip to Vintage Timberworks in Temecula, CA. They supply old timbers for many different uses, but we focused only on the gray board we would need for the garage makeover and barn wood for a few other projects. Their showroom looked like it belonged in Carmel by the Sea. No wonder we liked this place! Beautiful beams, doors and floors are made from the vintage timbers. The showroom was really beautiful, but it was time for us to catch a ride to the yard to pick out our timber. Someone actually picks you up in a golf cart and takes you out to the timber piles. I was so busy hanging on I couldn't take a photo! They also have their own mill on site and can cut and customize timber and apply specific finishes to your liking. There are so many choices available. Tom was in heaven here! These close up shots show the rustic detail of the gray board and the barn wood we were interested in. All of these old timbers are recycled from old barns and structures, many from the mid west and along the east coast, so they are very distressed and have such a beautiful rustic look. There are stacks of wood timbers available to choose from. We plan to use the barn wood on a few other projects and will use gray board only on the garage door. Tom picking out some of our timbers. and my favorite....the gray board! It was all so beautiful. We kept digging to find the most distressed pieces. These are some of the timbers we brought home. They are the most perfect shade of gray...really beautiful. I can think of several other projects where I will be using gray board. Before we left, we had them cut these 2 inch gray boards in half, so they would be the perfect size to re-face the existing plywood on our original garage door. and here is the finished project! and our 19 year old cat "Raja"
Wow! Sarah! Congratulations! I had been eagerly waiting...looks great! We need to celebrate! Call me soon! I also want to come and see your place. Beautiful blog!!!! Thank you so much for your comment! I am glad I discovered your blog!! Amazing result Sarah, your husband is a fine craftsman. Thank you for letting me know you have your blog up and running! Well done! I put you on my blog roll. You and your husband make a wonderful team! I love your inspiration. The before and after pictures are so dramatic! Your garage is absolutely charming. Thank you for the introduction to Vintage Timberworks. Steve and I are going to check it out! Thank you Brooke, we sincerely appreciate it :). You are going to love the gray board!! I am absolutely blown away by your garage door! I’m quite in love with the rustic, cottage style of home architecture, the kind that’s found at Carmel By The Sea, and I think your garage door really nailed it! And the fact that you made it yourselves is just as impressive! You did such a great job! I’m so jealous! I want one, too! Thank you Libbie! 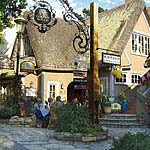 Have you visited Carmel By the Sea? It's a beautiful place and lots of home inspiration:)! Impressive! What you did to your garage door looks amazing! The new one is lightyears away when compared to the new door in terms of aesthetics. The old one was a bit dull and lonesome, but the new one looks classy and elegant, mainly because of its rustic, woody look. Picture perfect! And oh, I love the cat!! Your cat Raja seems happier than anybody else there. Haha! Congratulations again!